The guide to marketing your pastured raised poultry and eggs. Are you having difficulty selling your pasture raised chicken and eggs? Do you have a freezer full of chickens that you can't seem to get rid of? Do you wish you could sell your eggs for more money? As farmers we love the production side of the business. I personally enjoy spending my days walking through lush pastures with the sun on my face, interacting with my chickens as they enjoy their daily salad bar. What we struggle with is the business and marketing side of the operation. How do you differentiate yourself from your neighbor selling cheap eggs? What the he** is the deal with social media? Are customers even finding your website? That's where Farm Marketing Solutions is here to help. Proven strategies and actionable materials! There are many farming and marketing philosophy books out there and not to many that pair the two of them together. Well, I'm here to fill that gap. 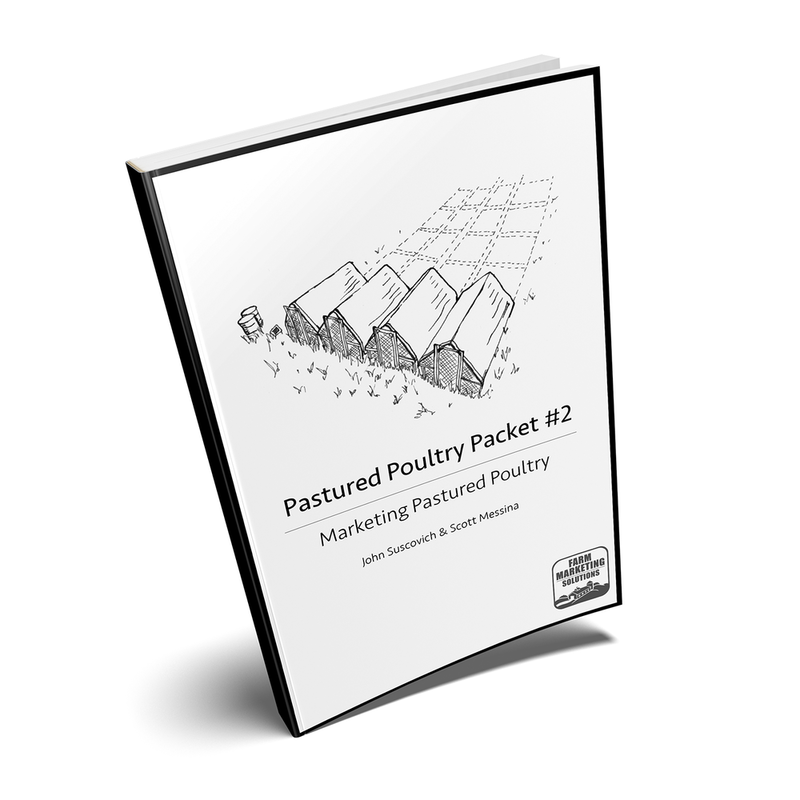 The marketing concepts presented in this workbook are applicable to any small business, but are specifically tailored to pastured poultry. While I cover the whole whole scope of your marketing efforts, it is all broken down into bite-sized, easy to digest segments. In Pastured Poultry Packet #2 we walk through everything you will need to know to improve your farm marketing efforts. Everyone has a talent or super power. Some people can eviscerate a chicken in 20 seconds, I can sell a chicken in 20 seconds. My super power is distilling complex concepts into bite-sized tasty morsels. Don't worry if you've tried and failed with learning marketing in the past, I am here to help. I have been raising and selling my own poultry since 2012 on top of building my own marketing company. Do you want to sell more chicken & eggs? Small farmers are charged with a monumental task of unwinding years of bad policy that has created a society which has forgotten what real food actually is, all while running a business. In our hearts we want to produce food that is healthy for people while rebuilding soil, improving animal welfare, and reinvigorating local economies. Thee scope of that goal can be hard to translate into a clear and simple message. While this book applies to any small business, I have chosen to focus on pasture-raised chicken and eggs to give a starting point to our collective farm marketing solutions. The change you want to see requires education. Education requires good marketing. That is what this book is all about. Too Simple To Fail Roast Chicken Recipe - FREE Download! I have had many marketing successes through the years. A lot of failures too, that's how we learn. One of the most successful pieces of content that I have created is my chicken recipe. Click the button to download a free PDF with the recipe. I also included the table of contents for the book and a few pages of the introduction section to give you a better feel for the book. Buy it in print, get the digital version free! It's 2018, we are used to getting things instantly. When you order the printed version of the workbook it takes me a little time to mail it. SO, to make sure you are happy right away I send you a download link for the digital version immediately after purchase so that you can get started with your pastured poultry marketing while you wait for me to mail your printed copy.